Rakusan did not include the Fan Series in his main sequence numbering. Therefore, the original number used for each of the 36 Series prints has been modified to identify the Fan Series members of its theme. The five different fan silhouette shapes have been here assigned arbitrary numbers 1 through 5. To indicate a fan design these shape designations are added to the 36 Series number separated by a hyphen. 129-4 is the Fan Series design with fan shape 4 in the 129 Double Camellia theme. Like all other designs in this series, 129-4 was only produced in a single print run, and few copies are currently documented. The prints in the 129 Double Camellia theme represent two distinct carving periods. Two of the five fan designs have seal C which indicates a carving date during the first half of 1934. 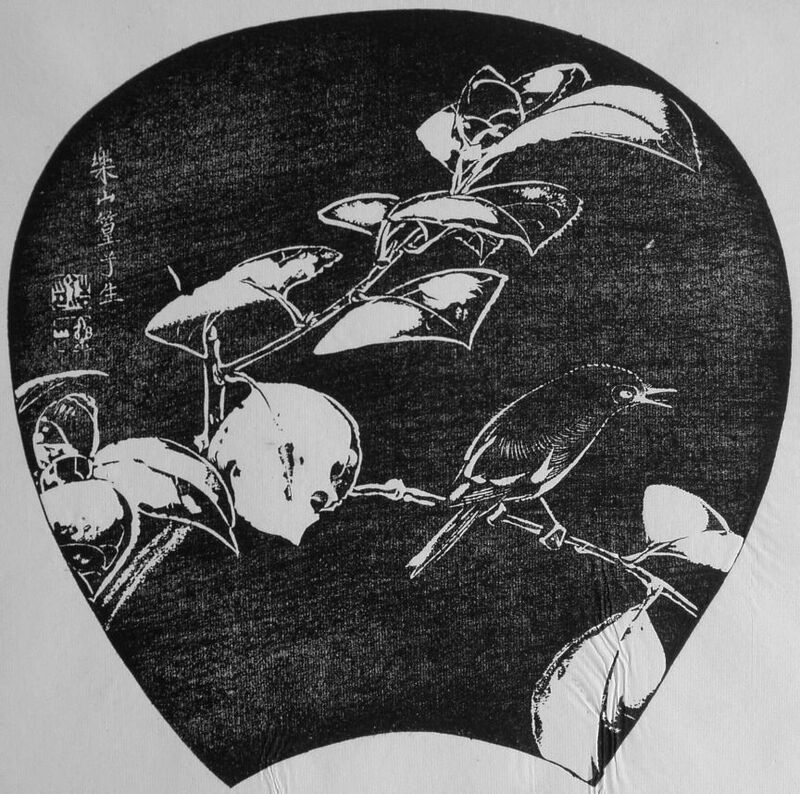 Despite the early completion of those wooden blocks, Rakusan delayed printing and distribution of the prints in what became the 129 Double Camellia theme until the following year. It was eventually grouped with other spring season themes nearer to the end of the series. The other three fan designs (including 129-4) and the 36 Series 129 have seal B which indicate a later carving period closer to the time of publication. The composition of 129-4 includes a single forking camellia branch with two terminal buds. Sitting on a side branch is a white-eye. All of the elements are rendered as line drawings. However, the mottling of the foliage includes solid patches. Both work equally well as ishizuri or reversed. Japanese White-eye, Zosterops japonicus, 繡眼児, 眼白, now usually 目白, めじろ, メジロ, mejiro, lit. 'white eye', is a familiar native species. The little birds are fond of overripe fruit and are sometimes easily captured when intoxicated and kept as pets. 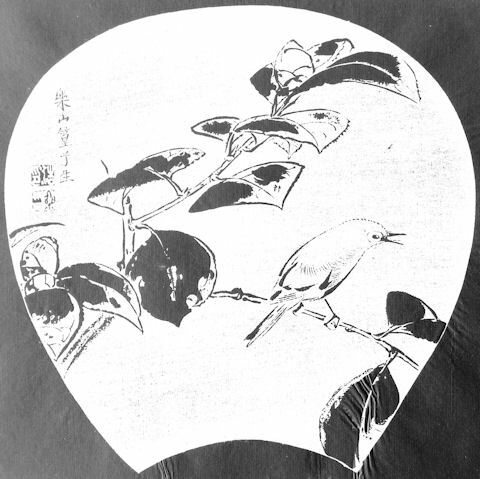 Rakusan portrayed these active little birds in several different designs.